Your emails and phone calls have been truly helpful. They have brought things to our attention we may not have thought of and this allows us to accommodate you better. You are important to us, and we so appreciate the support you give. As always, please reach out with any questions or concerns or if we can be of any assistance. Enjoy the last few weeks of summer. It is with great sadness that we share the news of the passing of one of our most beloved members. Lauren has been an integral part of our group since 1995 and touched the lives of our members in so many ways. 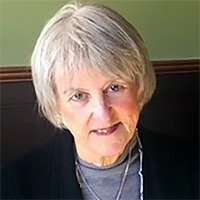 A clinical social worker with a private psychotherapy practice, she spoke at our meetings about coping with the psychological issues of living with a chronic disease. She wrote “The Gluten-Free Way” in our magazine touching on the emotional aspects of celiac disease with such great insight. A long-time member of our executive board, Lauren brought a balanced view to discussions and confronted issues with endless curiosity and caring. As an editor, educator, and executive board member, this amazingly talented and accomplished woman will be sorely missed. We send our deepest and heartfelt sympathies to her beautiful family. Dr. Ciaran Kelly, MD, at the BIDMC Celiac Center, is looking for biopsy-proven celiac patients (18-80 years old) who have been following a gluten-free diet but still have symptoms to participate in a research study. This clinical research study is designed to evaluate whether taking digestive enzyme supplements can help reduce persistent symptoms in patients with celiac disease who are following a gluten free diet. Would you like to dedicate donations “in memory of” a friend or loved one? After completing a donation, you may download a PDF receipt of your donation record to save for tax purposes. As always you can choose the amount you wish to donate! Coming soon are donation subscriptions allowing you to setup recurring automatic donations and NCA e-cards so that you can have a card sent via email to those you have donated on behalf of. Your donations are critical to helping us achieve our mission and even more important than ever now that we have expanded nationally! If you dine at Chipotle, please be aware that some branches are now offering a fried dessert, buñuelos, that contains gluten. At those branches, the corn tortilla chips will be contaminated due to being fried in the same fryer with the buñuelos. Read about it here. A member reported that The Daily Paper is now in the spot where Perry’s used to be on Main Street in Hyannis, MA. 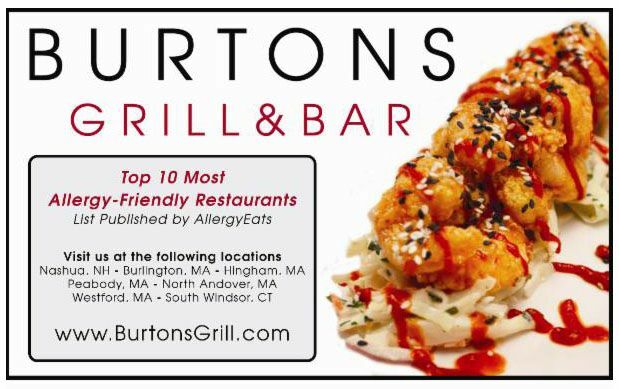 This breakfast and lunch place lists on its menu GF English muffin and GF waffles, but they have one waffle maker and they toast the muffin in the same toaster as bread with gluten, so clearly there will be cross-contamination here. 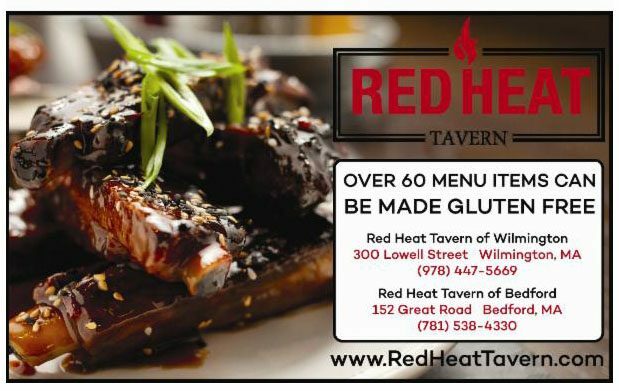 Many thanks to those of you who have added your favorite gluten-free or gluten-free friendly restaurant to our database. Do you visit a restaurant we don’t know about? 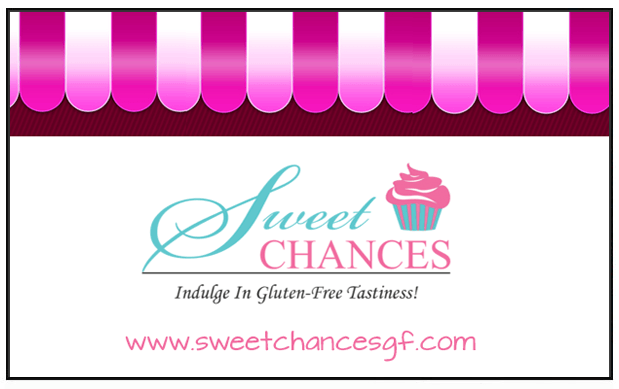 Help us to expand the directory by adding your favorite GF friendly restaurant here. Here is a podcast about celiac disease with Peter Green, Director of Celiac Disease Center at Columbia University. Here is a video review of 10 GF pancake mixes. Also playing on PBS, you can watch Gluten Free here. GF Jules recently did a podcast about a new study that found that gluten removed beer may not be safe for celiacs. Gluten Free and More published this list of new Gluten Free Products; have you tried any of them yet? A member found these delicious Marlenka Honey Cakes in a local Armenian grocery store, but we hear it is also available online at Amazon.com. A member found a GF cheese pizza with a cauliflower crust at Trader Joe’s. She likes the GF cauliflower crust especially for making quick flatbreads and is looking forward to trying the pizza. Costco has a list of new GF products, which includes rice, soups, pastas, cereal, salad dressings, dips, salsa, sugar, flour, bread, cookies, chips, snacks, protein powders, bars, shakes and other foods. Visit your local store for more information about what they carry since selection varies by store. Congratulations to Barbara W. of Lawrence, KS, who won the July giveaway of Murder Gone A Rye by Nancy Parra. 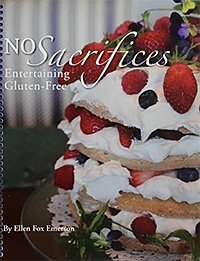 This month, you can win a copy of No Sacrifices Entertaining Gluten-Free by Ellen Fox. An article in the Lancet about celiac disease may be found here. Researchers investigated the contents, claims, and disclaimers of 14 glutenase products designed to ease digestion of gluten. Here is what they found. Is Buckwheat Gluten-Free? Gluten Free and More answers the question here. An Italian study determined that a lot of children with biopsy-confirmed celiac disease did not have sky-high celiac antibody levels prior to diagnosis. Here is an abstract. The latest Center for Celiac Research and Treatment newsletter from MassGeneral Hospital for Children is out. You can read it here. As students are thinking about heading back to school, Gluten Free Living has an article about Gluten-Free Dining Halls here. Oh and don’t forget to download our college survival guide! A restaurant asked an 11 year old who cannot eat gluten and had travelled there with classmates on a field trip, to leave and eat the food he had brought with him outside. Read about the ensuing lawsuit. Here is an article about cross contact from Beyond Celiac. Persistent gastrointestinal disorders that are common in patients with celiac disease following a transition to a GF diet are detailed here. More about the statement from the Vatican requiring low-gluten communion wafers rather than gluten-free can be found here. Following the statement from the Vatican, the Benedictine Sisters of Perpetual Adoration, who create a low gluten communion wafer, issued this statement. Information about how celiac disease can affect your oral health can be found on CDF’s website here. Sarah Ahmed discussed Oral Manifestations of Celiac Disease at the Medical Myths and Milestones Symposium we held in April. See the PDF from her presentation. Gluten-Free Watchdog is encouraging the FDA to investigate when products labeled gluten-free appear misbranded; here’s how you can help. Celiac and the Beast tested almost 80 types of GF breads and came up with this top 10 list. You can learn about the testing here. A GF rice flour plant will be opening in Arkansas. Here is a research roundup from Gluten Free & More. Live GFree Gluten Free Classic Soft White Hamburger Buns are being recalled due to a packaging error. Gluten Free White Bread was packaged into Gluten Free Classic Soft White Hamburger Bun packaging and contains undeclared egg. 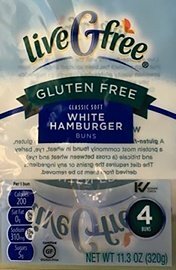 The recalled LiveGfree Gluten Free Classic Soft White Hamburger Buns were sold through ALDI stores from April 13 to July 27 in the following states: Arkansas, Washington D.C., Iowa, Illinois, Indiana, Kansas, Kentucky, Maryland, Missouri, North Carolina, Nebraska, Ohio, Oklahoma, Pennsylvania, South Carolina, Texas, Virginia, Wisconsin, and West Virginia. Read about the recall here: https://www.fda.gov/Safety/Recalls/ucm569131.htm and contact Jenene Kilian from Vibrant Health Products at (604) 743-4455 with any questions about this recall. Bush’s Baked Beans (Brown Sugar Hickory, Country Style and Original in 28 oz cans) have been recalled due to potential contamination with harmful bacteria. Consumers who have purchased the recalled products are asked to call Bush’s Consumer Relations at 1-800-590-3797 between 8:00 a.m. and 5:00 p.m. Eastern Time, Monday through Friday for instructions. 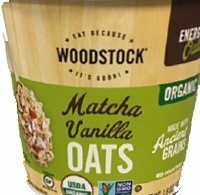 Matcha Vanilla Oats, in a 1.8 oz cup, has been recalled due to potential contamination with Listeria monocytogenes, an organism which can cause serious and sometimes fatal infections in young children, frail or elderly people, and others with weakened immune systems. The recalled product is marked with the Best Buy Date Code of “SELL BY MAY 11 2018” on the bottom of cup. 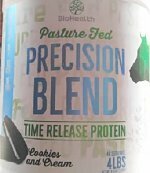 Biohealth Nutrition has recalled Precision Blend Cookies & Cream (2-lb and 4-lb white plastic canisters; all lot codes) due to undeclared wheat. Read about the recall here. This recipe is adapted from a recipe from “the Chew” TV program. Easy and delicious!